In 2014, the City of Anacortes embarked on the process to replace the existing Anacortes High School which in part dates back as far as 1931 with renovations in the 1950s. The City sought to build a state-of-the-art facility to provide a quality education to the students who graduate at a rate of 95%, one of the highest in the State of Washington. The site conditions required that the detention system be capable of containing large volumes of stormwater, but also needed to fit into restricted footprints. 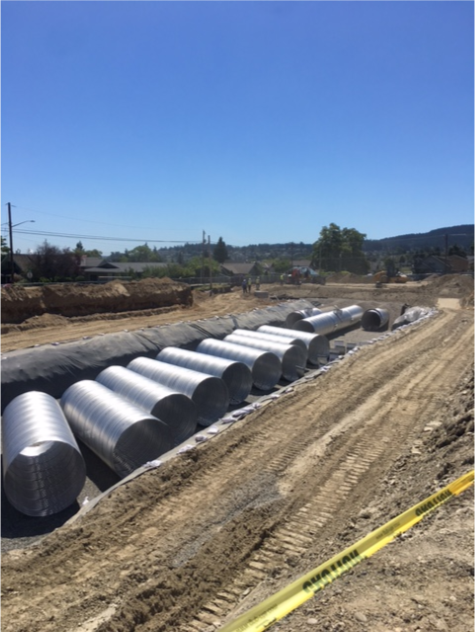 After considering multiple options, the engineer selected corrugated metal pipe (CMP) for the underground storage of stormwater because of its strength, design flexibility, durability, and cost competitiveness. In order to minimize the footprints, the engineer was able to take advantage of the available depth and use large diameter CMP for its efficient use of space. In addition, an ALT2 CMP was used which is environmentally friendly and provides extremely long service life. Three separate detention systems were constructed on the site. System one used 1,627 LF of 84” perforated ALT2 providing 62,422 CF of storage. This system utilized a single manifold with a series of stubs connecting six barrels. The system has an impermeable liner to maximize the detention volume in the given footprint, as the stone backfill can also be used as storage. System two used 596 LF of 84” of solid wall ALT2 providing 22,937 CF of storage. This system utilized a single manifold with five barrels. Contech provided support to the contractor to ensure a smooth and timely installation.